Pony Express to Ride Through Fountain Hills! Hashknife Express Riders on Avenue of the Fountains, Thursday, January 31, 2013; sometime between 1-3 p.m.
Come Downtown Fountain Hills, ya’all, and catch the Pony Express riding through! 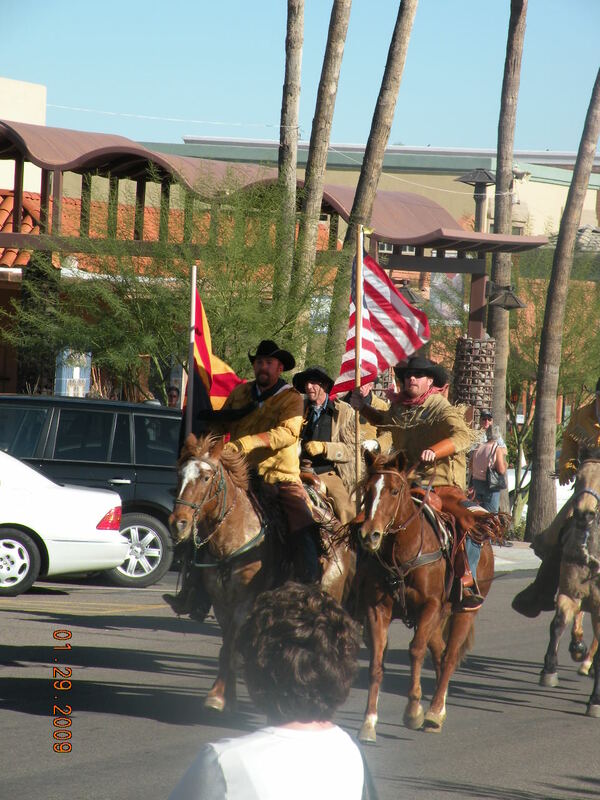 Each year on the last Thursday in January, the 4-6 actual Pony Express riders charge through the streets of Fountain Hills on their state-wide journey. The tradition, which raises money for the Holbrook, AZ Posse and Rescue organization, includes a stop at the Fountain Hills Post Office, where the riders sell Pony Express memorabilia, and deliver special hand-stamped mail. The group then continues into Scottsdale, where they traditionally lead off the Parada Del Sol Rodeo Parade on the following Saturday. The public is invited to come to the Avenue to wait for the arrival, expected between 1 and 3 p.m. Good parking is available behind the Sonoran Lifestyle Real Estate office, where the popcorn popper will be in full swing. The Farmer’s Market offers plenty of on-the-spot temptations or take home treats! Stroll among the Art on the Avenue vendors while you wait for the riders. Many new artists join us for the winter season, including custom Italian leather purses/cell phone covers and new intricate pewter jewelry, among 30+ vendors. Lunch, snacks and take-home dinners are available at the Farmer’s Market. 5 new vendors this week, in addition to our every-week Gluten-free Lasagna, to Tamales, Sandwiches and totally indulgent snacks…wasabi peanut chocolate clusters, Whoopie pies, cookies, fruit pies, fudge, jerky…and dozens of salsas, spices, salts jams and pickles. Be sure and bring your camera…you won’t want to miss this little slice of Arizona history that comes to life each January in Fountain Hills. This entry was posted in Area Events, Businesses We Love and tagged Art on the Avenue, Farmer's Market, Pony Express Riders. Bookmark the permalink.